Manxgirl living and crafting down under. : Come for a walk in the garden? I'll be off out to pull a few weeds soon, but before I go, I thought you might like a look about. It's not just cross stitch that is keeping me away from my sewing machine. First stop, the green house. And it is certainly living up to it's name. It seems like I spend a huge amount of time sweating in there as I keep the tomato vines trimmed to allow the light into the fruits. Speaking of fruits, see that huge bush at the back there, with yellow flowers? An apple cucumber. I had never heard of them before I found this one at the garden center. I'm told I could have planted it outside. I think I will next time. 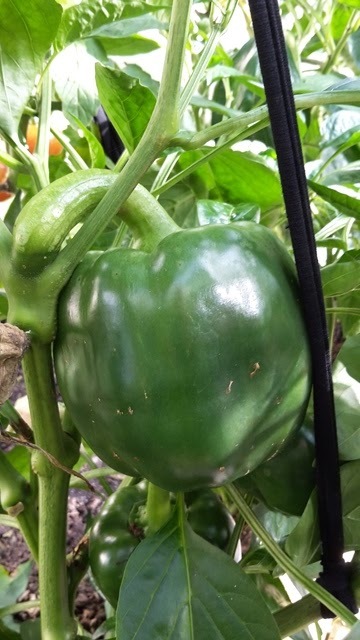 It has lovely sweet fruits, they are a pale apple green and a little rounder a fatter than the usual varieties. 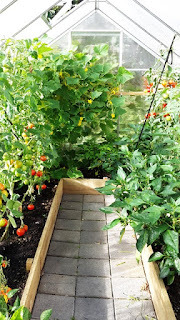 The tomatoes are still going strong and each week I make up sauces or soups and store plenty in the freezer. And I've given plenty away. Also in the green house we have chilli peppers. They are finally turning red. Ours seem to be slow compared to Debbies, but then good things are worth the wait. There will be plenty of them I gave up counting at 40! 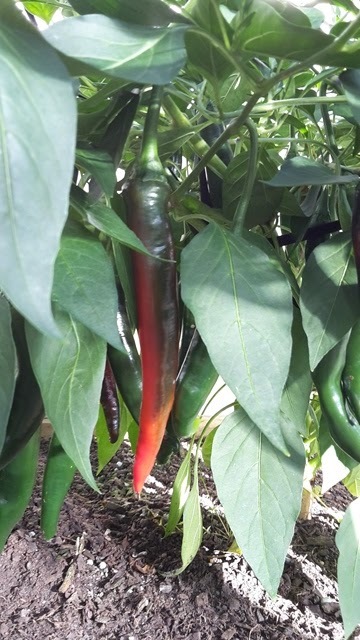 Hopefully the capsicums will start to change colour soon too. We have picked and eaten a few green ones, but it would be nice to see some other colours in there. I also have capsicum bushes outside, but they are for another day. Speaking of outside. My wee veggie garden in the corner is also still going well. 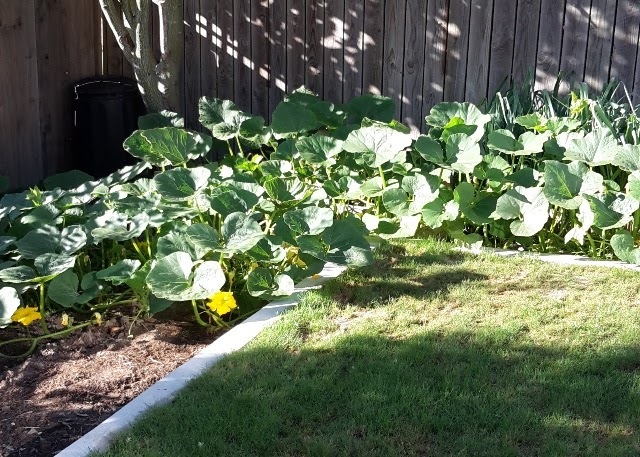 As you can see the pumpkins are rampant! I have three varieties. 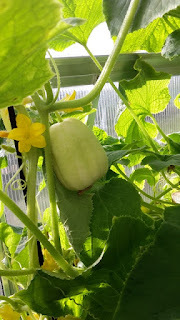 I had saved seeds from some that were given to me and a spaghetti squash I had purchased. 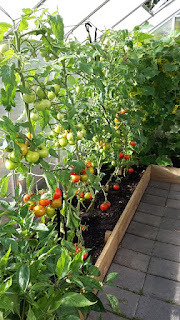 I planted them early indoors and was delighted when they all germinated. 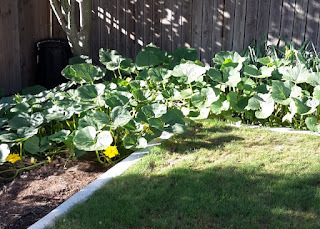 All though I planted three kinds of seed, I have four types of squash!! Any way, if I'm right, they are called little cutie. Sorry, no pictures of the crown pumpkin or the spaghetti squash, I couldn't get near them! There are a few out there though. My gardeners diary says that it is now time to stop the growing points on the vines and allow the plants to concentrate on the fruits. Thats a job for today. 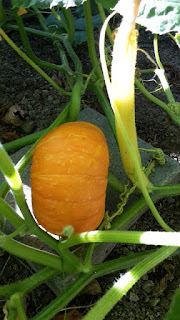 Maybe while I'm in there I can get some pictures of the other varieties. Almost hidden by the pumpkins is the rest of the veggies. 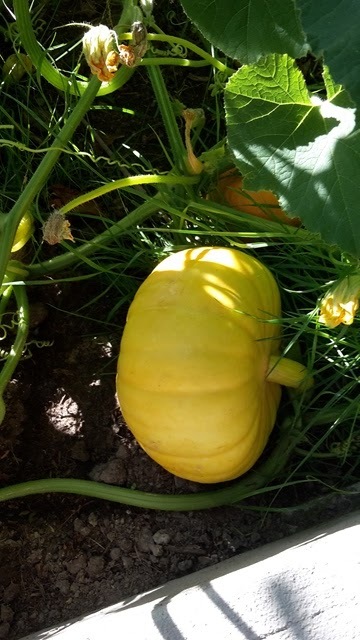 They look like they are nearly ready. They are a little small, but that's ok. Behind the corn is leeks and beans. The beans are a little too close to the fence and not terribly happy. But they are still producing and we've had a few to eat. I'll rethink those next year. 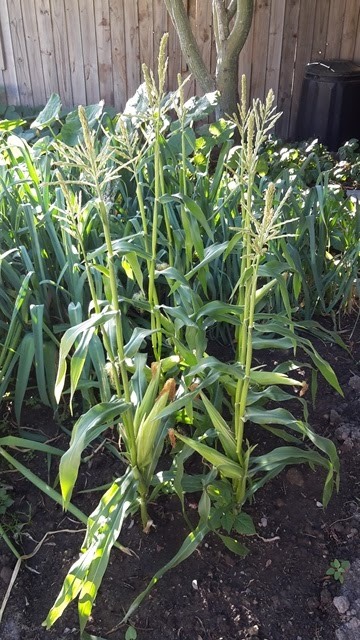 The leeks are almost ready to come out too. There are a few I'll need to pull soon and either use or freeze. One is about to flower! We decided that we needed a clock outside. 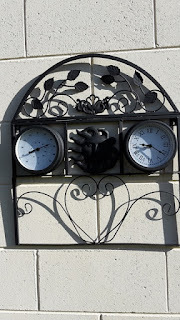 Tony found this wrought ironwork with clock and temperature gauge. Very pretty and useful too, saves us craning our necks trying to see into the kitchen clock! Right, I'm off to work for an hour or so, before it gets too hot! You've done so well with all your vegies.